They started out modestly enough, playing as the Brooks, the Atlantics and the Bridegrooms in minor league competition before graduating to the National League in 1890. A century later, the Dodgers had become one of baseball's best managed and most successful franchises with a model ballpark, fanatic fans and a history of innovation second to none in the game. Entering the 20th century, Brooklyn's team was dubbed the Superbas after a traveling acrobatic troupe popular at the time. They would also be known as the Robins before settling officially on the Dodgers in 1933. When the National League's Baltimore franchise folded at the turn of the 20th Century, a number of Orioles' stars came to Brooklyn, including manager Ned Hanlon, and won back-to-back pennants in 1899-1900. Brooklyn knew mostly lean years until one of Hanlon's old Baltimore teammates, Wilbert Robinson, became the manager in 1914. Robinson forged Brooklyn into a contender and won pennants in 1916 and 1920, mostly with veteran pitching staffs and Hall of Fame outfielder Zack Wheat (.312 and .328 those two years). The Dodgers slipped from contention shortly thereafter, but colorful characters like Babe Herman earned the team the nickname the "Daffiness Boys" and kept them beloved in Brooklyn. While things on the field were a bit silly, the front office was growing and cultivating a crop of serious young players. Soon Ebbets Field would be home to a litany of legends, none more so than Jackie Robinson. When the Dodgers promoted Robinson in 1947, they were poised for greatness. Led by manager Leo Durocher, they won the 1941 pennant. After slipping during the war years, they finished second in 1946. With Robinson as a sparkplug, the Dodgers took the flag by five games over the Cardinals the following year. Robinson was the first African American on a major league team in the 20th century. He endured the pressures, the taunts and threats commiserate with a society not fully ready to accept him, and the fact he hit .297 and stole 29 bases to lead the league changed the game and began to change the country. Robinson was joined by fellow Hall-of-Famers-to-be Duke Snider, Pee Wee Reese, Roy Campanella, and near-Hall of Famers Gil Hodges and Carl Furillo. The rise of the Dodgers refueled the team's bitter rivalry with the cross-town Giants  a rivalry that reached volcanic proportions when, in 1948, Durocher committed the most unpardonable of acts  he left Brooklyn to manage the Giants. For the next decade these two teams would be at each other's throats, and the winner would more often than not match up against the Yankees in the World Series, ushering in a decade known as the golden age of baseball in New York City. The Dodgers won the 1949 pennant led by Robinson's .342 average, league-high 37 steals and 124 runs batted in. Hodges had 115 RBI and Furillo 106. The team then endured two seasons of heartbreak. In 1950, they lost the pennant to the Phillies on the last day of the season, and in 1951, they committed their legendary collapse, losing a 13½ game lead and finishing the season in a tie with the hard-charging and hated Durocher-ites from the Polo Grounds. The Giants won the immortal playoff series on Bobby Thomson's ninth inning home run in the third and deciding game. Losing forged a toughness that manifested itself in the Dodgers' most glorious run of all - pennants in 1952-53, 55-56. The 1953 team was most impressive, with Snider (.336, 42 HR, 126 RBI), Campanella (.312, 41 HR, 142 RBI), Furillo (.344, 21 HR, 92 RBI) and Hodges (.302, 31 HR, 122 RBI) in peak form. The only black cloud darkening the franchise's door was the team's historical lack of success in the World Series. Up through 1953 it had lost all seven World Series in which they played. These, plus the difficult endings to the 1950 and 1951 seasons, left Dodgers fans with an empty feeling and a constant cry of "wait until next year." Next year finally came in 1955, when the Dodgers beat the Yankees in seven games for the franchise's only world championship in Brooklyn. It took them seven games, but the victory set off a wild celebration in the New York borough matched only by the V-E Day celebration a decade earlier. Unbeknownst to Brooklyn fans, as they celebrated the 1955 championship and rooted the team on to the 1956 pennant, Walter O'Malley, now the team's owner, was unhappy with the small and antiquated Ebbets Field facility. Even in the best of times, the Dodgers had a tough time selling out the park. By 1957 O'Malley had negotiated, pleaded and threatened New York City officials to help him find a new location to build a better ballpark. Without the cooperation he felt he needed, O'Malley heeded the invitation of the Los Angeles city fathers who offered him everything he wanted. The era of baseball in Brooklyn came to a sad end as only 6,700 came to see Ebbets Field's swan song in September, 1957, as the Dodgers defeated Pittsburgh 2-0. The Dodgers led the geographic expansion of baseball west of the Mississippi, starting the 1958 season at the Los Angeles Coliseum. They moved to Dodger Stadium in 1962. Some of the veterans of the Ebbets Field era were wearing out and the team was rebuilt around an incomparable pitching staff led by Sandy Koufax, Don Drysdale and veterans Claude Osteen and Ron Perranoski. Koufax, whose career was cut short by an arthritic elbow, might well have put together the best six-year span any pitcher has ever had. From 1961-66 he went 129-47, leading the league in wins in 1963, 65-66, ERA from 1962-66, and strikeouts in 1961, 63, 65-66. The Dodgers rode this era of pitching and defense to world titles in 1959, 63 and 65, plus the pennant in 1966. Their next trip to the World Series came in 1974, but they lost to Oakland. Walter Alston, who had managed the team for 23 seasons, retired in 1976 and handed the reins to Tommy Lasorda. Supported by a star-studded infield (Steve Garvey, Dave Lopes, Bill Russell and Ron Cey) that played together for eight seasons, longest in the game's history, and along with sluggers Reggie Smith and Dusty Baker, the Dodgers won consecutive pennants in 1977-78 but lost to the Yankees in the World Series. The Dodgers took a measure of revenge against New York with a six-game win in the 1981 World Series. It was the year of "Fernandomania" in Los Angeles, when the fans' adulation was directed at a 20-year-old Mexican rookie named Fernando Valenzuela, who won his first eight decisions, wound up winning 13 games (in the strike shortened season) and copped both Rookie of the Year and Cy Young Awards. The Dodgers had one more magical season in 1988. They had little offense, but they did have Orel Hershiser, whose pitching exploits matched those of his dominating Dodgers predecessors. He went 23-8 with an ERA of 2.26. He set a major league record with 59 consecutive scoreless innings, pitching eight shutouts, including six in a row in his last six starts. The Dodgers won the National League West and beat the heavily favored New York Mets in the National League Championship Series. They capped the season with a near sweep (four games to one) of heavily favored Oakland in the World Series, with Kirk Gibson's memorable game winning pinch-hit home run setting the tone in Game One. Since then postseason appearances have dwindled, although they did make the NLCS in 2008-09. Despite the sluggishness since the mid-1990s, this is still a franchise that has earned its reputation for success with six world championships, 21 pennants, nine Cy Young Award winners, 10 MVPs and an incredible 16 Rookie of the Year recipients. They are also innovators of the first order, having led baseball's move to the west coast, broke the color barrier with Jackie Robinson, televised the first baseball game (at Ebbets Field in 1939) and introduced the batting helmet in 1941. Tony Cingrani 1.0 " "
Yimi Garcia 1.0 " "
Adam Liberatore 1.0 " "
The National League Bridegrooms kept their American Association team name then changed their name to the Superbas after the 1898 season. After twelve less than superb seasons they tried the Dodgers names in 1911, then settled on the Robins for an eighteen year period. In 1932 they went back to their origins and remained the pride of Brooklyn through 1957. Did you know that the Los Angeles Dodgers have had more Rookie of the Year recipients than any other franchise and hold the record for most consecutive honorees with five (1992-1996)? 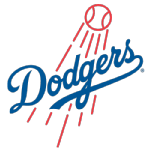 Do you believe that the Brooklyn Dodgers should have moved west? Should they have stayed in New York and become the modern day New York Mets? Share your opinions on our baseball message boards today.